Calligraphy Art class in the R-room is designed to learn the basics of Japanese calligraphy as well as creating your own piece of Japanese calligraphy art using the techniques you have learned in the class. The class is for both Japanese and non Japanese speakers. ＊You can join from any class, please try! Interpreter is attending every class. There are currently 4 news. Until 5 in the latest order will be displayed. In this class, we would like you to learn not only calligraphy but also have experience of create various works of art using calligraphy. Historically, calligraphy is the way of informing something to others. In addition, we believe art of drawing attract people as an unique artwork itself. While we are writing documents by using PC, we change fonts or size to emphasize our intention, or choose available pictograms in Text messages so as to show our inner feeling. We lean basic forms of character, such as (Kaisho) Square style, (Gyosho) running-style script, (Sousho) fully cursive style, (Reisho) demotic semi-square style, (Tennsho) an archaic script, and Kana etc. Then we will create our own artwork by using those characters. Also we create original seal by Tenkoku (see ③) or Kaou (See ⑤ ) which is regarded as Japanese signature. We will try many times by using the same material and enjoy improvement of each outcome. To see “step by step improvement” is one of the fun in our class! We can also join exhibition if you want. 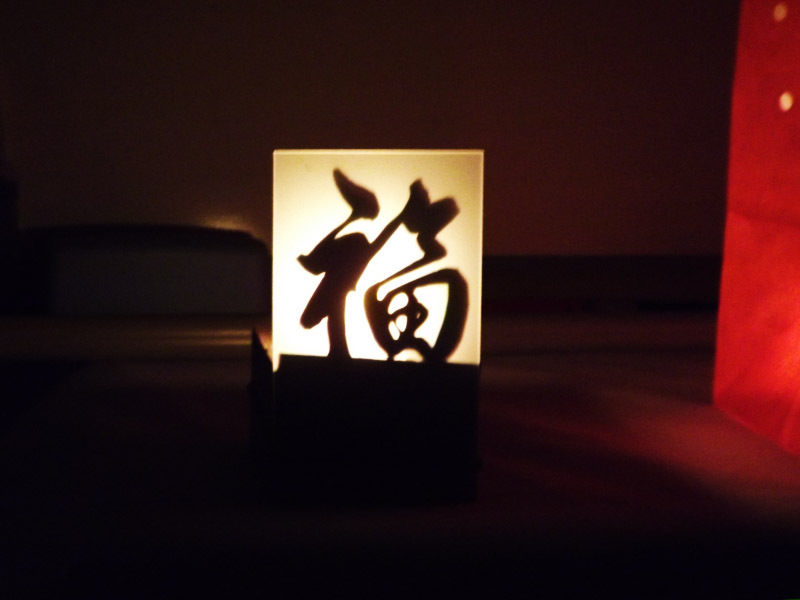 First of all, we begin with writing our own name beautifully by (Kofude) small brush. Please see ① which our teacher wrote．Each of us can receive this sample from teacher and kept imitating the sample until we can write similarly without checking the sample. As a second step, you will try to make square panel at work after choosing your favorite Japanese words. Our final target is like Yamamoto teacher’s below (⑥⑦)and Serizawa’s artworks (⑧⑨). Followings are artwork for new trend of Computer graphic with calligraphy, called “Design Calligraphy.” These are relatively easy work if you have mastered how to draw characters. Her Calligraphy career spans over 20 years and she is a 5-year consecutive Winner at the Yomiuri Exhibition from 2001 through 2005. She is a New age Calligraphy artist of artistic characters and a Master of stippling. Our concept is not only to study basic traditional writing but you will also have an opportunity to experience making these artistic characters in a carefree and joyful environment. 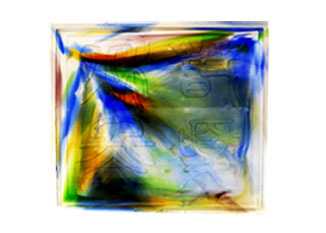 We will create unique artwork each session in a wonderful, calming atmosphere. We guarantee everyone will enjoy making and creating these characters. 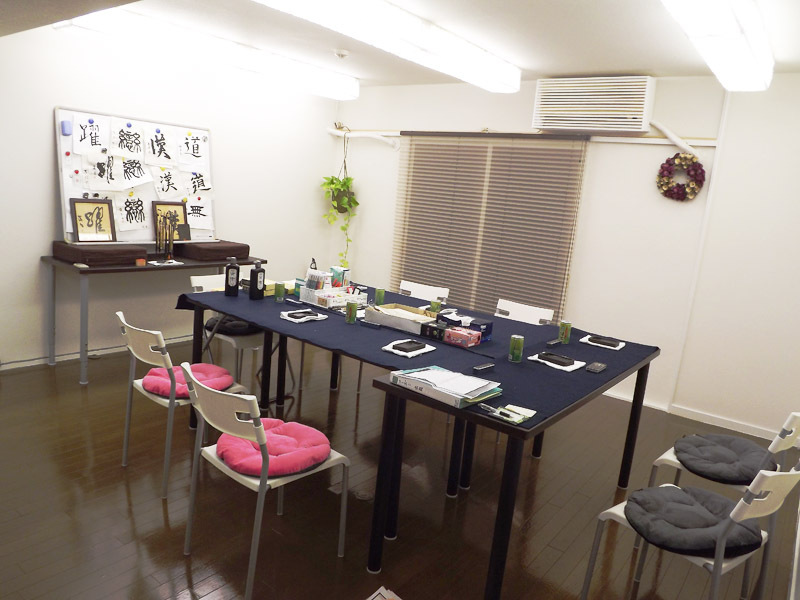 An interpreter will join the class, so don’t worry if you have no experience of Japanese art or the Japanese language! If you have studied even a little bit of Japanese, you can expand your Japanese interaction skills in real situations, as well as learning a beautiful Japanese art technique! Practice of four types of historical basic writing. Learn how to write your name by FUDE (typical Japanese brush pen) and create INKAN (simple handmade rubber stamp used as a seal). Completed artwork will be placed in a Japanese frame with your original seal. Learn how to make your own seal by stippling using plastic rubber. Choose up to four of your favorite characters and create your own wall scroll. Ink painting (black-and-white suiboku-ga ) can be added as an optional choice. Choose your favorite four characters and create Lapis Lazuri art. Examples are a room lamp, photo stand, wine glass, wine bottle, and pen stand etc. Create your own KAOU (your signature using Kanji Characters). KAOU has been used for our personal signatures since the 10th century. It was popular in the Edo period until the initiation of the INKAN (Stamp) when it was then used less often. Now this KAOU will be used as your official signature for your passport or credit card. Please book your convenience class to join by telephone or e-mail form which is available from our web site schedule. If you want to join the class on the day with the class, please make reservation by the phone. ※ For reservation or more information , please contact us by telephone or mail form. In Japan which ever ceremony you may be invited, you are supposed to write your name and address to entry your attendance by calligraphy brush. If you can write your name with beautiful letters you are respected by the other participants. On the other hand if you cannot write it in beautiful letters, you feel ashamed to entry. Taking this opportunity, please train your writing and become proud of writing your name in front of audience. 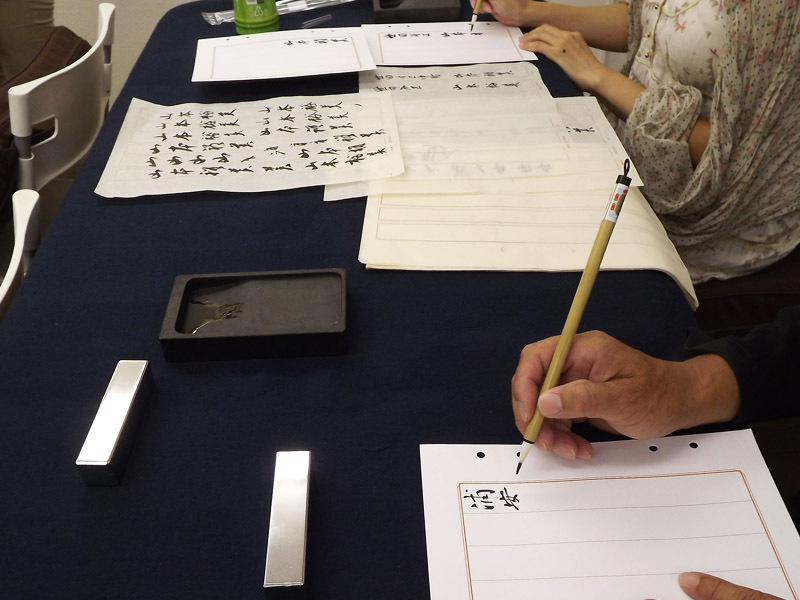 Note: In this lesson, brush, inkstone, mat, weight are prepared by us. You can take out brush after lesson. Drop charge is 5000 yen per class, so please feel free to join from any class. As this class fee is not paid monthly base, but it is paid by stamp coupon, you can join any class and you do not have to come every week. Stamp coupon costs 18000 yen for 6class. Coupon isvalid forever. ※This ticket has no expire date. ※Not allow to share with other person. ※No refund by any reasons. Please make your own plan. Reservation from a telephone or mailform. 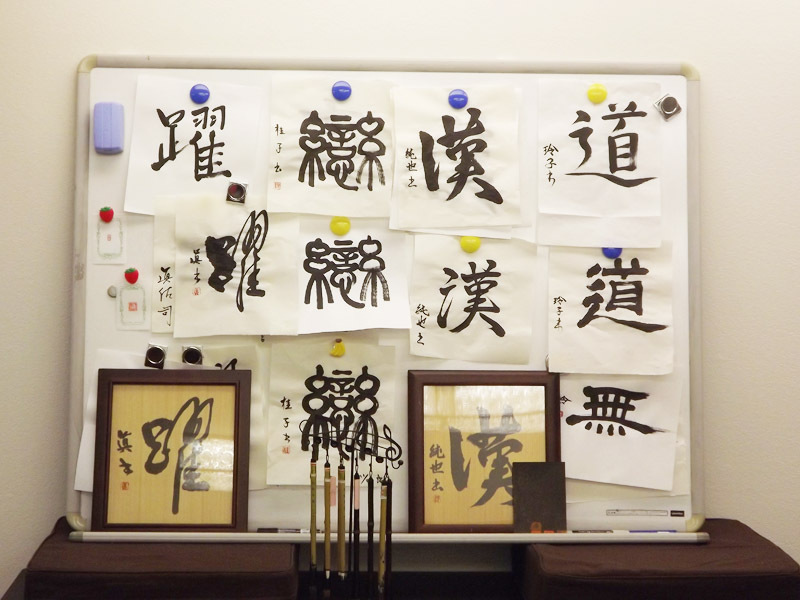 Calligraphy-art Class is located on the 4th floor of the Roppongi Hights (condominium) , near Roppongi Crossing . Access : 2 minute walk from Roppongi Station of Hibiya line, Oedo Line subway. Or 5 minute walk from Ropongi 1-chome station of Nanboku line Take Exit 6, (Hibiya/Oedo line) you will find “HUB” at your left side. Walk 2 minute towards Tameike Direction (down the slope) , you will find TOKYOBED shop, and find entrance of Roppongi Hight in the same bldg..
At the entrance, please　use interphone and press “0408呼” after a while. The door will be opened without any voice, so please go inside, and use lift to come up to 4th Floor. #408 is the left side of the floor lane.